First post of this series ended with code snippet, which invokates importAction itself. It’s not still the importing itself, but we are almost there. This post will be about what happenes, what hapened before and what is going to happen :-). But first things first, let’s have a look on Factory and Proxy pattern, which are used while calling imports. Now it’s possible to put those patterns together and get real importAction functionality: importAction is just an interface, which hides importActionImpl newly created for every request. This can be seen on following snippet of application context configuration. As I wrote a while before – all of this is done due to posibility of calling something else. But back to implementation, for details refer to some AOP documentation. 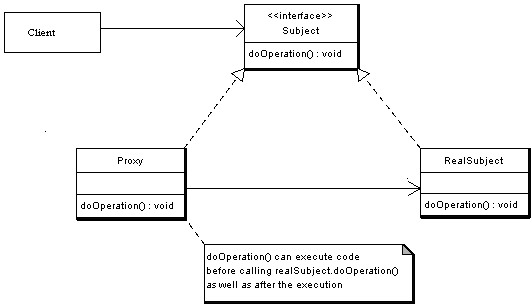 Method importAction.invocateImportScript() is a pointcut, on which two advisors are bound. Have a look at following diagram. All what ImportActionAdvice does can be seen on previous snippet. It locks used config file to prevent access from another thread, using node uuid as a locking token. Then it authenticates a system user (mainImportThread runs outside any security context) and invocates next chain (DeployContentAdvisor and after then invocateImportScript(), if everything goes ok). After return from invocation lock is released and security context is cleared. If anything happens inside, lock release is skipped, so some rescue mechanisms are automaticaly initiated after some time. Simple, yet effective, i hope. This entry was posted by shmoula on 15.5.2012 at 14:29, and is filed under Programování. Follow any responses to this post through RSS 2.0.You can leave a response or trackback from your own site.